Slice each leek in half lengthwise, and then slice each half into 1/4″ thigh half-moons (px. 2 cups). Place in a large bowl of cold water and swish to remove any grit. Drain and pat dry. Remove the stems from the kale, stack the leaves on top of one another and slice them crosswise into 1/4″ wide strips. Heat oil in a saucepan over medium heat. Add the leeks and cook for 3 mins. Add the tomatoes and cook, breaking them apart with a spoon for 5 mins. Add the water and bring to a boil. Stir in kale, sweet potatoes, lentils, thyme, salt, pepper and basil. 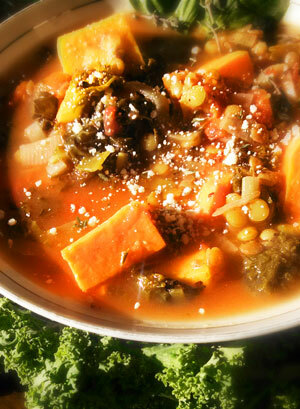 Simmer until lentils are tender, about 30-40 mins. Place romaine leaves on a work surface. Divide the chicken strips evenly among the romaine leaves, followed by the cucumber and carrot. Lightly sprinkle feta cheese over each. Tuck in sides and roll up. Serve immediately or wrap individually in plastic wrap and serve later. Serves 1 (4 wrap-ups). Spread tortilla with mayonnaise and, if desired, mustard. Layer turkey, lettuce, tomato, and bacon on half of the wrap. Season to taste with pepper. Roll up tightly, folding in sides as you go. Serve immediately or wrap in plastic wrap and serve later. Serves 1. Whisk together Dijon mustard, lemon juice, and thyme in a small bowl. Whisk in the mayonnaise and the capers. Let rest to blend flavors. Or try Follow Your Heart® low-fat Ranch dressing (25 calories per 2 tablespoons). Carefully open pita bread to make pockets. Spread hummus inside and arrange vegetables in the pockets. Serves 1. Toss spinach with edamame in a large salad bowl. Arrange chicken, bean sprouts, and carrot attractively on top. For dressing, whisk together rice vinegar, soy sauce, and sesame oil in a small bowl. Drizzle dressing over salad. Sprinkle with sesame seeds, if desired. Serves 2. *Note: Shelled edamame are now available in the frozen food section of many markets. Arrange salad greens and vegetables on 2 large plates. Flake salmon over the top. Drizzle 3 tablespoons of dressing over each salad. Sprinkle with sesame seeds, if desired. Serves 2. Place 4 to 5 ounces of cooked meat (chicken, turkey, canned tuna) on a plate. Add 1 or 2 steamed vegetables (broccoli, spinach, asparagus, green beans). Season to taste with freshly ground pepper. Serves 1. Whisk the vinegar and mustard in a bowl. Add shallot, if desired. Slowly whisk in the olive oil until well incorporated. Season to taste with pepper. Let stand for a few minutes to blend flavors. Serves 2.